Here are three of DorkySon’s favourite things in the world. Showing off how well he can count. 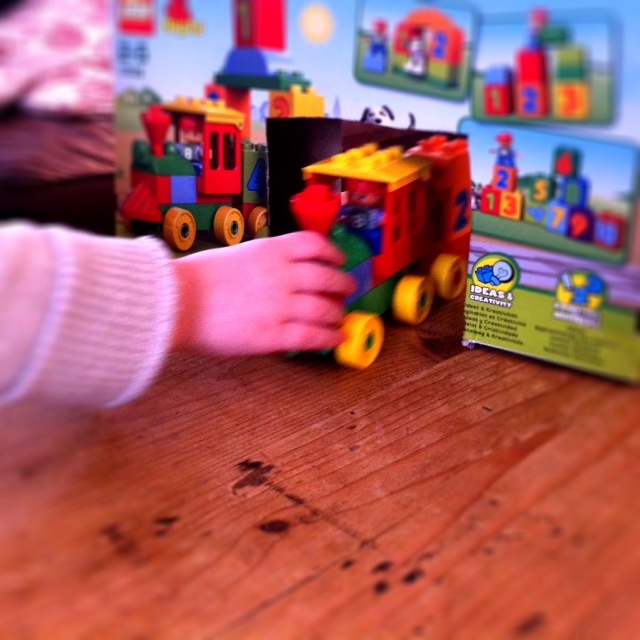 I don’t say yes to many review opportunities, but when Netmums asked if we’d like to try the new LEGO DUPLO counting train, I could not reply to the email quickly enough. DorkySon loves DUPLO. He will be four at the end of the month. He has some ‘big boy lego’ too. He likes his catamarans and his quad bikes if I’m there to help him, but DUPLO is the stuff he can really get to grips with on his own. It is a non-nursery day. It is raining. We have exhausted the opportunities that CBeebies has to offer. There is soup on the stove and there are brownies in the oven. The iPad has been confiscated due to poor behaviour. DorkyGranny is knitting. DorkySon is lying on the floor of our den, already building a tower out of DUPLO bricks. I’m signing that silly computer pad thing, smiling at the postman, while he looks behind me, over my shoulder at the chaos, the cushions on the floor, the socks strewn across the hallway, the many obvious signs that DorkyDad is away on a work trip this week. Right there, that moment – that phrase – is why DorkySon is the best-nearly-four-year old in the world ever. And why LEGO is the best brand ever. It is so layered, so flexible, so much designed to keep its place in the toybox for years. When I was a four year old, I would have opened the box, and noticed that the carriages all connected with each other. Three days later I might have noticed that there were numbered bricks to stick on the carriages, and maybe after a week or two I would have had some Eureka moment and spotted that if you stack the numbers in the right order, the bricks also follow the colours of the rainbow. DorkySon got all that – took that all in – in about three and a half minutes. He then asked me to cut the box so he could turn it into a tunnel. Then he realised that one of the LEGO DUPLO cars he already had in his toybox could be converted into another carriage, and if he wanted he could get out some extra people to be passengers. He wondered if he could build another bridge. Then he licked my face, with the dog that came with the train. Then he worried about whether we had a box, big enough to store the train in, that would fit in his room. Then he decided that actually, it didn’t matter too much, and maybe his LEGO DUPLO train could just reside on the living room carpet beside the LEGO DUPLO tower that has been there for the last six months. This is LEGO at its very best. This is LEGO that lets little boys’ and girls’ imaginations run wild. This is LEGO that really lives up to its Age 2-5 label on the box. It does not stereotype – by gender, interest or age. 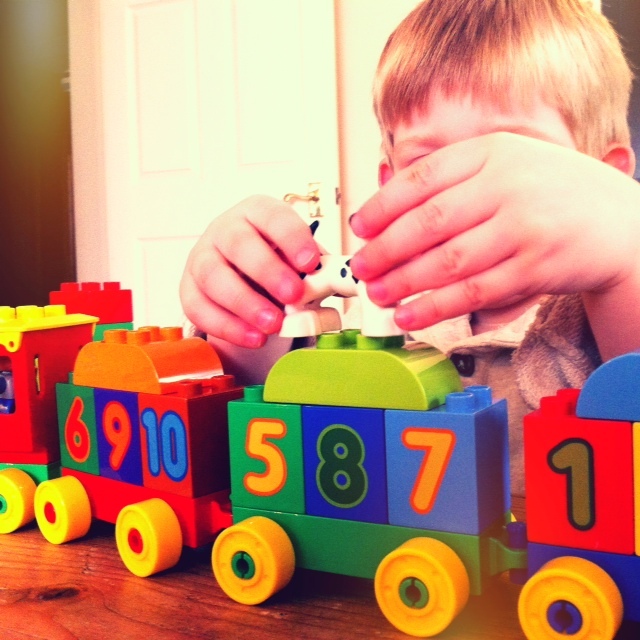 We all know that our kids develop at different rates, but sometimes toy manufacturers don’t. They try to sell us one toy for our son when he can count… and another for when he likes colours… and another for when he gets into vehicles… and yet another for when he is into imaginative play. Maybe he will, DorkySon. I hope so too. 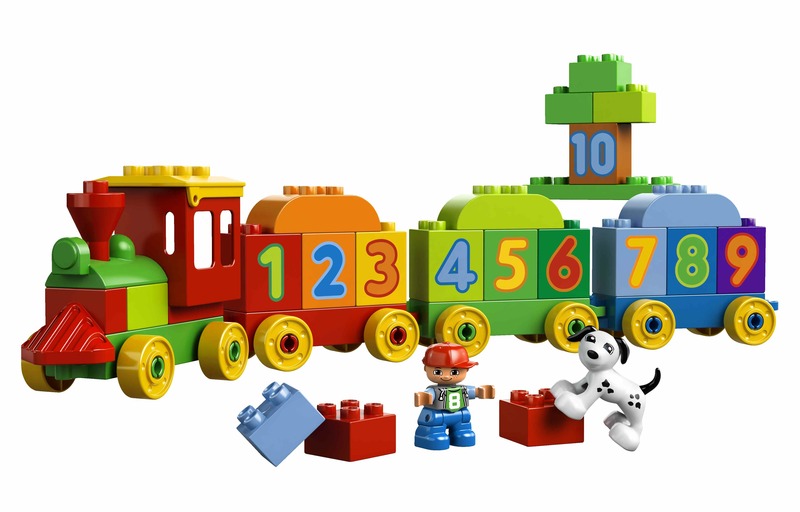 That looks brilliant, my little one just turned 2 this week and is really REALLY into trains and loves his building bricks too, he can’t quite count yet but is starting to get it a bit. I wonder if you can get this in Australia – it looks ACE. Your son has the same loves as mine. That’s a pretty cool train. Great review! I’ll make a note of this one…we’re also vehicle obsessed over here and counting is in progress. Thanks x.
Georgie is getting one of these for her birthday, from her softie of an Uncle. It looks so cool! That looks great. I think there are some toys that you’ll just keep and keep, regardless of what the age grouping says on them. My two still play with one of them got when they were 1. I’m going to put it in the attic when they’re done with it, pass it on to potential grandchildren! I can’t help but think of Winthrop in The Music Man when he sing, “oh, the Wells Fargo Wagon is a-comin’ down the street, oh please, let it be for me!” Lego has been one of the most creative and educational toys since the 60s (when I had it) – someday I hope to visit LegoLand – and I hope the Dorkey Family will get to, as well!